November 2016 continues to be a trying month. I’ve had a few snafus but nothing tops losing a best friend. My closest buddy (both physically and emotionally) succumbed to ovarian cancer Monday evening and we will lay her to rest today. 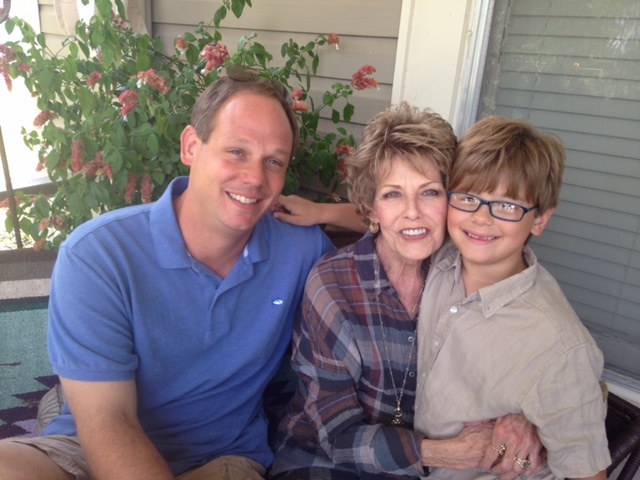 She is pictured above less than two months ago with her son John and grandson Nathan. I’m not sure how life will be without Brenda. We worked in our gardens together and shared anything and everything including a deadly illness which also took one of my best high school buddies. As I was working on Thanksgiving dinner yesterday I started out the door a dozen times to borrow her red casserole dish I borrow every year. And I needed her recipe for sweet potatoes which I never got around to writing down because I could just trot over and get instructions over a cup of coffee. We’ve also unapologetically appeared politcally incorrect wearing furs dating to the 6os. 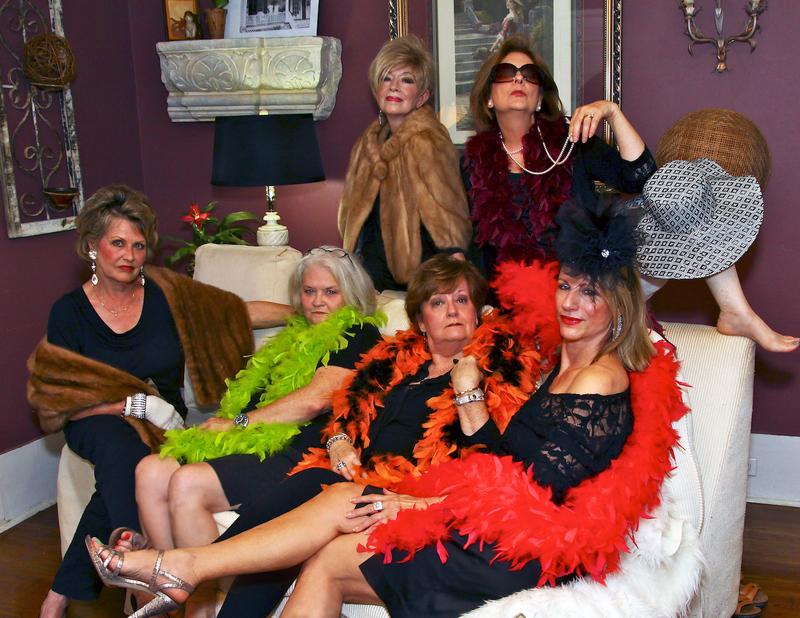 Brenda is at far left and the word “glamorous” doesn’t do her justice. One of my fondest memories is of our garage sale a few years ago. We were going to make enough money to take a cruise but ended up just buying each other’s junk. It was only 55 and one half steps from her door to mine. We beat a path along that expanse over a period of 13 years. We discussed world events, celebrated small victories, complained rarely and competed on our tomato crop. She always won. She was like a big sister without all the sibling rivalry. 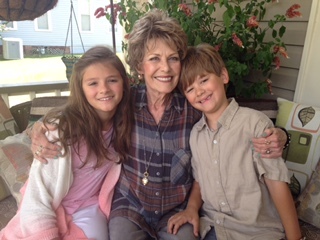 Brenda was one year older than I – just turned 70 in September – and she was more beautiful today than when she was named Mississippi’s Miss Hospitality and runner up to Miss Mississippi in the late 60s. Life on Green Street just shifted into a lower gear, and facing her house each day will be bitter sweet for a while…at least until spring when her old garden phlox spring into bloom and the butterflies return and the fish in her Koi pond come out of hibernation. Before she died I told her to save me a front row seat up there – no back row for us! We’ll pick up just where we left off. In the meantime I’m hoping to hear from her each time I detect the feint tinkle if the Mississippi wind chimes she gave me for Christmas one year. I hope everyone has a joyful Thanksgiving and don’t forget to hug tightly those people you treasure most. So sorry for your loss, Emily. Emily, I am so very sorry to hear about Brenda. I can only imagine how hard this must be for her family and for you, her dear friend. May you find comfort in knowing that she is with the Heavenly Father and that she is in a much better place than we are. Emily, I am so sorry for your loss, as well as her family. It is very sad but know she is rejoicing and celebrating with our God. Sweet tribute to a sweet and lovely lady. I know you will miss your times together but aren’t we thankful for the gift of memories?Your post brought to mind our friend, Frances. Love you my friend and hope you have a great Thanksgiving with the boys on Friday! I cry at movies and sometimes at TV commercials so you can see that I am a big crybaby. From your niter I had a old fashion bawling…tears and snuffy nose…the whole works. I pray that God and all the angels on high smile on you and Brenda’s family. Tom can’t understand why I am crying..that is OK cause if he had read your blog today I would still be picking Kleenex off the floor in front of his chair. We are both ole Softies ? It is a wonderful gift to be able to express the feelings of life so clearly that we feel that we have shared your experience. Emily we are saddened by the loss of your dear friend. Praying the times you shared will keep you company in her earthly absence. Hugs and elderberry wine…. Thanks to all – especially you Chet! After the funeral yesterday I sat and watched one hokey hallmark Christmas movie after the other and would cry huge gulping sobs periodically to the distress of my furry family. I think every sad event in my life was being regurgitated. Today I feel strangely refreshed. Carole, does this happen to you since Meredith left us? I highly recommend, and yes Chet, I tear up during coffee commercials and the beer one featuring the Klidesdales (so?). I have been praying for you especially yesterday. I hope your sons have made it home and spoil you rotten! Emily, you are in my prayers on this day of thanks. May your sweet memories of a special friend carry you until you can smile again. Friends like this are a gift from God! Love and hugs! Today of all days, we are Thankful for the blessings of good friends. Thinking of you today and may you cherish all your memories with Brenda for they are precious beyond words.